With a high rate of return for patios, now is the time to take advantage of a Nicolock pavement. You may not have any current plans on moving, but your home is an investment that you need to constantly work on to maintain its value. With a high rate of return for patios, now is the time to take advantage of Nicolock paving stones. When a new homebuyer first looks at your home, they want to be able to envision themselves living in it. The first way to create that impression is to increase curb appeal. Current homebuyers do not want to have to pay more money to build patios, decks and other fixtures, so a home that does come with a nice feature such as a Nicolock paver patio is very attractive. Remember, with today’s technology a homebuyer normally gets their first impression from pictures online. With Nicolock, you can impress potential homebuyers before they even step foot onto your property. Many homeowners in Abingdon are taking advantage of the many ways Nicolock can boost their home’s curb appeal. First, Nicolock paving slabs are beautiful and very cost-effective options. You don’t have to break the bank to add an amazing patio to your home. You may also worry that installing a patio using Nicolock now will not look as good by the time you are ready to sell your home, but that isn’t true! 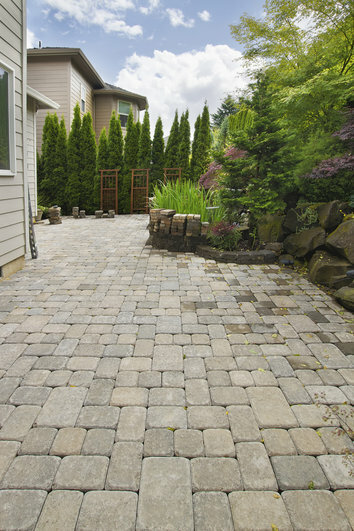 Nicolock patio pavers retain vibrant colors that won’t fade over time. Finding the right patio is not easy, and that is why it’s important to work with a professional. A professional service will not only help you select a patio that you will enjoy, but you also have the benefit of working with someone who knows what type of styles will boost your home’s curb appeal for years to come. You won’t have to make guesses or try to hop on the latest trends, as selecting a classic style will impress any potential homebuyer. This entry was posted on Friday, May 15th, 2015	at 4:21 pm	. Both comments and pings are currently closed.